Contest: Win A Horga’hn Statuette From Star Trek! 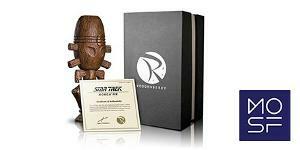 Win A Horga’hn Statuette From Star Trek! Prize: Your very own prop replica of the Horga’hn statuette, the Risian symbol of fertility from the world of Star Trek, donated by Roddenberry Entertainment! The winner will also get a 3-Day pass to Escape Velocity 2019!